My adventures as a triathlete, Mountain Biker and aspiring bike racer. I signed up for SnotCycle in the fall, excited to have a January race on the calendar to kick off the season, and riding for ABRT. 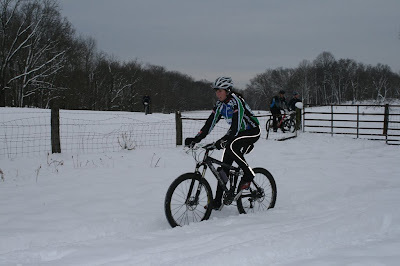 Even more excited that it was an MTB race, making the variable winter conditions less of a factor for the day. Or so I thought. I knew the weekend was going to be cold, and I was ok with that. (Losing heat in the house 3 days before did not help mentally, but I guess in some ways, it was like acclimation training). There was snow on the ground, but we were assured that it was would packed down by Saturday morning. So I headed to VA Friday night to stay with Pete and Igda, get a good pre-race meal and a warm night's sleep before venturing to Leesburg in the morning. Sixteen Cat 2 women toed the line Saturday morning, none of us quite sure how the day would play out. Pretty sure I jinxed myself by joking with Rich at the start saying, "I'm not even carrying CO2. If I flat, I'm just gonna run my bike in." HA! At that point, I was more concerned with the ice that was covering the parking lot and driveway, never thinking ice would be the least of my concerns. Race director gave us a "ready, set, GO", and we were off. I get clipped in, find my way to about mid-pack just before the single track and I'm feeling good. (Note: that took all of about 60-90 seconds). About 50 yards into the single track, still within shouting distance of the start line, we hit some soft, 4-5 inch powder that is unrideable and we're all off our bikes, pushing, running, trying to find the next section of rideable snow. As we ran, most of us were laughing, joking about this being a 'cross race, how we should have just worn sneakers, in generally good spirits until we look up and can see the tail of the Cat 2 men's field that started in front of us, still walking their bikes around the course. Things got a little quieter as I think people started to consider the situation and whether it was worth it to be off the bike this much. The conversation then turned to scenarios: Do we need to have our bike physically on our person when we finish? Can we dump the bikes here in the woods and pick them up on the second lap? If we have to finish with our bikes, HOW MUCH of the bike? Can I leave a wheel here and save weight? None of the questions were being asked in jest. Fortunately, teaching all those cycle classes this winter kept my cardio in good shape so I was able to jog at a reasonably good pace. My legs starting screaming, I could feel the inevitable bruises on my right calf from continuously hitting the pedal, but there was no way I was quitting. Unless I broke something or started puking, I vowed to keep running/walking/pushing, hoping I'd hit some rideable section anytime soon. So the good news. I never got cold. My hands, feet, core were all nice and toasty. In sub 30 degree weather, that was a nice surprise. The "other" news: Even when I hit rideable sections, the snow was so packed into my cleats that I could never clip my right foot in. I rode where I could, but felt like I was losing valuable time just trying to get that second foot clipped in. The last 2 miles in the trees definitely had rideable sections and I was able to get in the saddle for sections at a time. But between the frustration of not riding and the fatigue from running (in bike shoes, in the snow) for that long, I struggled with my balance (still unable to clip in the second foot). All in all, I probably ran 7.5 miles and rode 1.5. If that much. I crossed the finish line in 6th, with only 9 of us actually completing the course. Lee handed me a beer and I called it a day, happy to be done. It took me just over 2 hours to complete a lap that, under normal conditions, should have taken me about 45 minutes. Overall, I actually had a good time. I'm always pleasantly surprised and reminded how chill the MTB community is. These conditions were less than ideal, and was hardly the "race" we'd all signed up for. But everyone stayed positive, made the best of it, kept smiling and did what we could. At least it gave us something to talk about for the weekend. What doesn't kill you only makes you tougher. Or in this case, more damn stubborn. Looking forward to NiteRyder in March and HotCycle this summer. Hoping to snag a spot on a Baker's Dozen team, too.